Facebook has released an update to its iOS mobile app that includes several new features, the most noteworthy being the ability for users to call friends for free within the app. 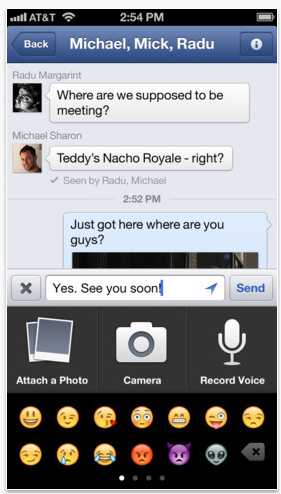 This feature was released earlier for its Messenger app, but now the social network is bringing it to its main app. Unfortunately for its 680 million mobile users, Facebook is restricting usage of this calling feature to those within the US and Canada. While it’s a free service, Facebook does want users to know that it will use the existing data plan on the mobile device — so if you don’t have unlimited minutes, you might want to be careful about using it. Included in this update are improved buttons to like, comment, and share posts, and an updated share button that can re-post stories from a user’s News Feed available in all languages. With the phone calling feature, users will go into the chat sidebar that slides from the right of the screen and select a user that they wish to contact. From there, they can tap the “i” button in the top-right corner and select “Free Call”. All users will need to have the latest version available today in order to make calls. Until they do, the “Free Call” button will be disabled. By bringing this calling feature into Facebook’s main app, the social network is making it more accessible to potentially millions more — while specific numbers haven’t been released, it’s hard to imagine that more users have Facebook Messenger installed on their mobile device versus the Facebook app. To that end, now regardless of whatever Facebook product you have, the company will ensure that you’re that much closer to being connected with people in your network. As TNW’s Matthew Panzarino pointed out last month, the endgame here is carrier plans that include less emphasis on phone minutes and text messages than ever before and greater focus on getting customers to pay for more data. It’s apparent with carriers like Verizon and AT&T retreating from their unlimited data plans in favor of more phone-centric service like texting. This feature is now available in the Apple App store.